Give your students the best platform for learning! Why GAUSS in the Classroom? 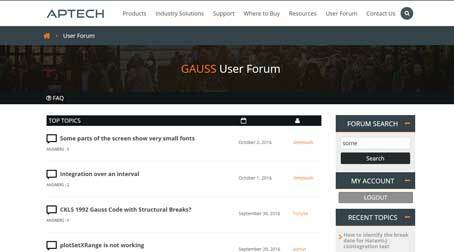 GAUSS speaks math - The intuitive GAUSS matrix language makes it simple to run pre-built analysis and create custom cutting-edge algorithms. Interactive computing - The interactive GAUSS interface provides the feedback and insights to keep students engaged and learning every step of the way. Unparalleled student support - You teach the theory while we teach the programming. Powerful computing - Tackle the most complex computing challenges with the efficient GAUSS mathematical engine and unlimited multi-threading support. Professional Graphics - Effortlessly create, edit and share modern, high-quality graphics. Any in-house GAUSS Applications needed for the class. Requirements: Professor owns or has access to the current version GAUSS and any of the GAUSS Applications requested for the students. Request Quote to Update to GAUSS 19. How to Apply: Complete the form below and include your class list to get started. Acceptable file types: doc, docx, xls, xlsx, csv pdf, txt, csv.